FedEx recently conducted a study where they began putting sanitizer stations in their office as a test to see if less employees came down sick. The results were an absenteeism decrease. The study concluded that Purell hand sanitizer decreased the spread of germs in the office as well as reduced the amount of sick days employees took by approximately 20%! Recent studies have shown that lost productivity due to illness costs US employers more than $260 billion annually. That 20% reduction in sick days could mean a savings of $52 billion every year if offices all used Purell! Of course the benefits of clean hands and fewer germs extend far beyond the office. You could say that Purell and I have quite a history. When I first started working if I wasn’t just on the verge of a full-blown cold, I was recovering from one. It was an endless and vicious cycle, and one that my boss and co-workers weren’t too pleased about. That’s when hand sanitizer came into the picture. 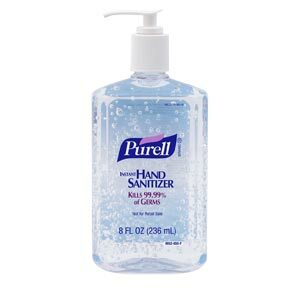 When my boss insisted that I begin using Purell Hand Sanitizer you could say it was love at first sight for my weak immune system. What a brilliant invention: the closest thing to washing my hands…in a tiny portable bottle. And if you think you’re doing a decent job of keeping you and your workspace clean, think again. FACT: Your phone is dirtier than your toilet! NBC reports that the average office phone is covered with more than 25,000 germs per square inch whereas toilet bowls on average only have 50 germs per square inch…Yikes! Common surfaces that we come into contact with each and every day at the office are actually considered to have more germs than toilet bowls!! (Need to clean those toilets? Try these). I can’t afford time away from work and you probably can’t either. Have no fear though; Purell is proven to kill 99.9% of the germs that it comes into contact with which cause sickness and infections. Use Purell and live a happier, germ fee life! Previous Post Global Handwashing Day!